"Future Ride" by Dan Abnett, Brad Walker, Andrew Hennessy, and Gabe Eltaeb. 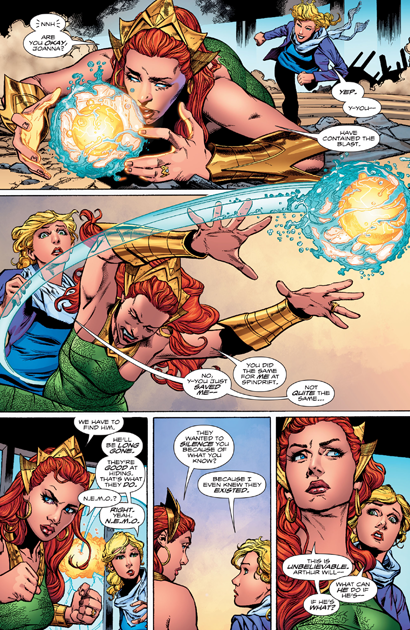 In her meetings with The Oracle of the Widowhood, Mera is presented with nightmarish visions of Atlantis' utter destruction. 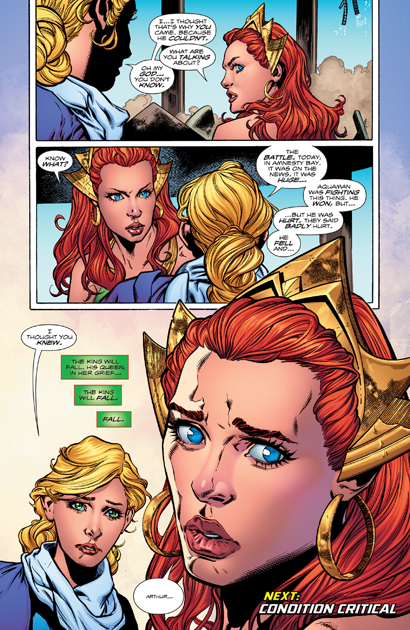 The Widows reveal that they oppose Mera's marriage to Aquaman not because of her Xebel roots, but because of these visions. They think Mera will take over after the king has died, and her reign will lead to the end of the world. 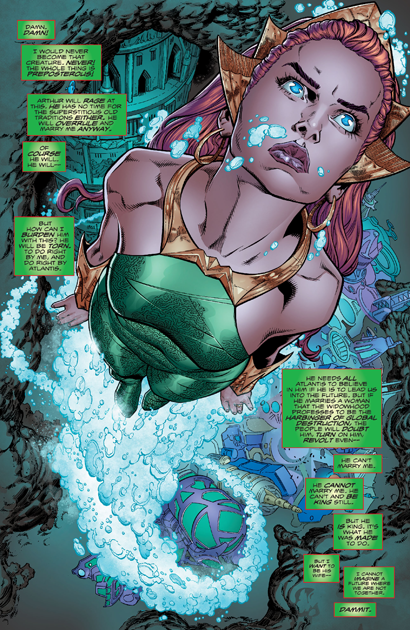 Mera is, of course, skeptical, and heads back to Amnesty Bay for some quiet contemplation. After reuniting with Salty (Aquaman Shrine FTW), Mera finds a note left by Lt. Stubbs, who saved Mera's life when Spindrift Station was attacked. They meet at a nearby restaurant, only to fall victim to an attack from a member of N.E.M.O.! Normally, this would not present much of a threat to Mera, but the assassin's heavy weaponry and disregard for innocent bystanders gives him just enough of an edge to get the drop on her. 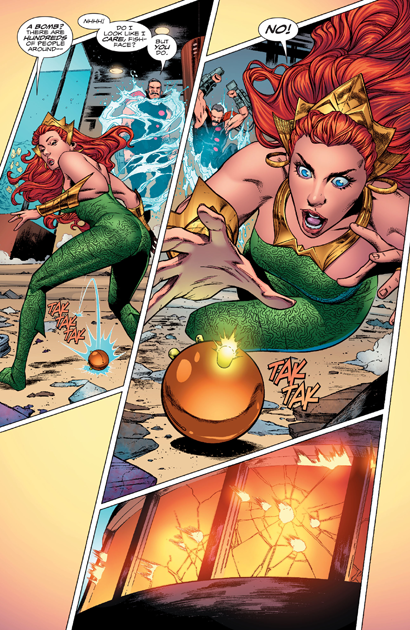 While being crushed by a wave of hard water, the assassin drops some sort of grenade, and Mera has to do everything she can to contain the blast. She does, but in the confusion her adversary gets away. Mera decides she has to find Aquaman, and it's up to Stubbs to tell her the bad news: that in his fight with The Shaggy Man, Arthur is in critical condition. To be continued! The previous iteration of the solo Aquaman series did something similar, giving Mera a solo spotlight during the first year of the book. I thought that was a great idea, and fairly well executed. I'm happy to say that it works again here, with writer Dan Abnett putting the Queen of the Sea through her paces in an exciting, involving story. He is immeasurably aided by the work of Brad Walker, who I have been gushing over since Aquaman #1. 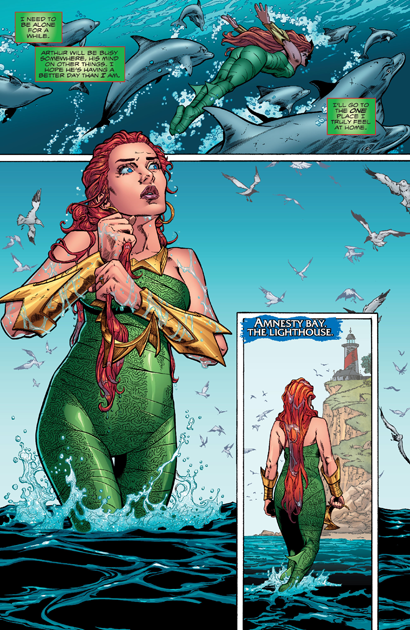 His idiosyncratic style meshes well with the stories Abnett is telling, and he does some of his finest work here, adding wonderful little bits of character-based details, like Mera squeezing her hair dry when she comes out of the water (see above). Walker is exceptional at facial details, and even though he's only drawn a small handful of issues, I feel as though he has already staked a claim for giving us a distinct Aquaman and Mera. Considering how many artists have drawn these characters (hundreds, at this point), that's no easy feat. DC, please make this a poster. 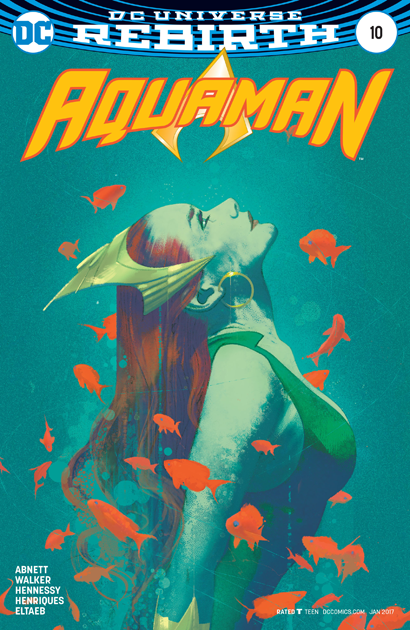 Or, at the very least, the cover to some sort of Mera-centric TPB collection. Aquaman #10 is on sale now! One of my favorite issues of the Rebirth series too. Both covers are stunning and Abnett's use of sub-plots and for-shadowing to the upcoming Deluge arc show his strengths as a writer. I have to admit I do miss the central them from Johns run regarding Arthur & Thomas Curry & the accompanying regular flashbacks to Arthur's childhood. And sometime's Abnett's word choice really jumps out at me as weird. 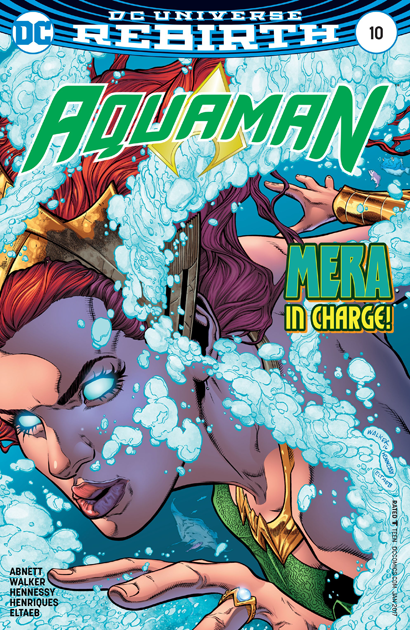 Like Mera referring to herself as " a creature from the sea" -- is this just me?